A border jack gets a strong work ethic from his parents. The cross breed of the border collie and Jack Russell terrier is sufficiently popular to have its own name: border jack. This lively breed's appearance and personality are drawn from those of its parents. If you are considering adding a border jack to your family, you should study his origins. A border jack is smaller than a border collie and larger than a Jack Russell. He looks more like the Jack Russell but often has a longer, wiry coat. Although he has a stocky body, he is extremely agile, making him an ideal teammate for playing Frisbee. The border jack is known for his canine sports prowess and he'll love entering sports competitions where he'll jump fences and wriggle through hoops with ease, and a great deal of speed. He needs a lot of exercise and may not adapt well to living in a confined space, such as an apartment. 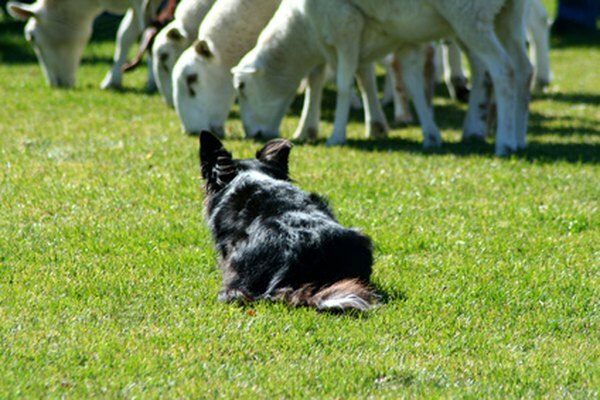 The combination of the collie and terrier intelligence with his need for activity means he is not an ideal breed for new dog owners, as he requires more time and training skills than some other breeds. The border collie was bred to work. The best sheep herder on the planet according to the American Kennel Club, he controls a flock with stalking and eye contact. He might even herd you if you don't get him out the door quickly enough. If he isn't doing something, he's not very happy, and he needs more than just a walk around the block for exercise. A joke in the book "Planet Dog" sums up the border collie's workaholic tendencies: "How many dogs does it take to change a light bulb?" The border collie answers, "Only one! And I'll replace any wiring that's not up to code!" The Jack Russell breed was developed in the 19th century by an English vicar called, yes, Jack Russell. It's a mix of many terrier breeds with a bit of Dachshund thrown in. While the border collie is a herder, the Jack Russell is a hunter, and the breed's primary job in the past was rat catching. Like the border collie, he's highly active and his hunting instincts make him fond of digging up your yard. Temperamentally he's a jolly little dog with a lively intelligence, and you'll probably find that he thinks he's a big dog in a small body. He is very trainable and the breed often appears in television and films. Eddy in the series "Frazier" is an example of a Jack Russell with a media career. One of the most significant skills a border jack has is his proficiency at flyball. This is a type of dog relay race in which a team of four dogs race over jumps, retrieve a ball and return. When the first dog completes this run, the next dog takes over and so on. According to "Planet Dog," the team always includes one smaller, but extremely fast, dog. Border collies account for almost 50 percent of the top flyball dogs and Jack Russell terriers for 10 percent, so it is unsurprising that breeders have come up with a cross breed of these two to create the border jack, the perfect dog for flyball. Look into local flyball tournaments at the North American Flyball Association website as a way to exercise your border jack.